Schwannoma-like pleomorphic adenoma is a rare variant of the common benign salivary neoplasm, pleomorphic adenoma. This entity’s cytomorphology closely mimics a schwannoma, potentially making a diagnosis of cytologic preparations or of surgical specimens a challenge. To the best of our knowledge, there are only six previous reports of schwannoma-like pleomorphic adenoma with eight total cases in the English language literature prior to the addition of the two cases detailed in this report. Our report includes what we believe to be the first documented case of this entity occurring in the submandibular gland. One of our cases occurred in the submandibular gland of a 90-year-old woman and the other occurred in the left parotid gland of a 40-year-old woman. We also examine the diagnostic considerations used to differentiate these two entities. 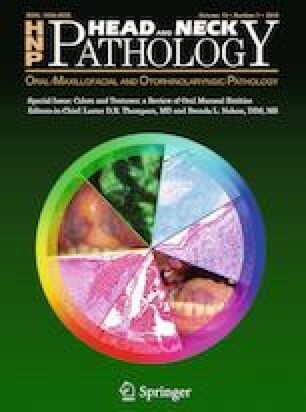 The authors would like to acknowledge Dr. Kasturi Das, MD for her assistance with the cytopathologic interpretation of these cases.